A parliamentary report of 1777 recorded parish workhouses in operation at Woolwich accommodating up 100 inmates, and at Plumstead for up to 45 inmates. Between 1838 and 1868, the parish of Woolwich was part of the Greenwich Poor Law Union. In 1868, as part of a large number of changes to London's poor law organisation around that time, a new Woolwich Union was created which took in three parishes formerly belonging to the Lewisham Union. The new union officially came into existence on 10th March, 1868. Its administration was overseen by a Board of Guardians, 17 in number, representing its constituent parishes of Charlton next Woolwich (3 Guardians), Kidbrooke (1), Plumstead (5), and Woolwich (8). On 2nd April 1870, the foundation stone for the new Woolwich Union workhouse was laid by the Revd Francis Cameron. It bore the inscription "The poor ye have always with you". 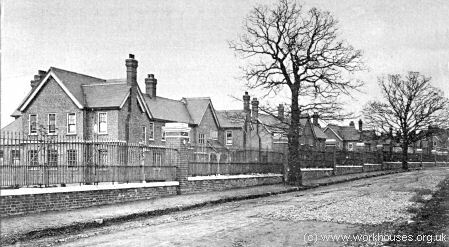 The workhouse was situated at Tewson Road, between Skittles Alley (now Riverdale road) and Cage Lane (now Lakedale Road) at the south side of Plumstead High Street, and was designed by the firm of Church and Rickwood. Just inside the gates at the north-west of the site were a porter's lodge, receiving and probationary wards. Casual wards, at the north-east, had their own entrance from Hull Place. The T-shaped main building had a central entrance hall, off which were a board room and offices, and a flight of steps leading to a landing and a 400-seat dining hall. Corridors to the right and left from the landing led to the wards for able-bodied males and females. Above the dining hall was the chapel, which accommodated 360 people. It contained an ecclesiastical armchair, elaborately carved in oak by a 66-year-old inmate of the institution. At the rear of the main building, on the women's side, was a laundry containing thirty-two tubs and other equipment. At the back of the men's yard were painters', carpenters', wood-cutters' and smiths' shops. Under the stores at the back of the chapel were the kitchen and bakehouse, the latter producing all the inmates' bread in six-ounce loaves, plus four-pond loaves for the union's outdoor poor. From around 1904, birth certificates of those born in the workhouse carried a euphemistic address so as not to stigmatise them in later life. The Woolwich workhouse's address for this purpose was 79b Tewson Road, Woolwich. 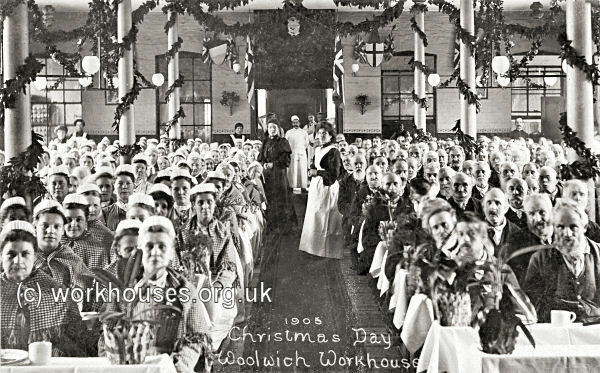 "Woolwich workhouse dining-hall — Christmas Day, 1905." 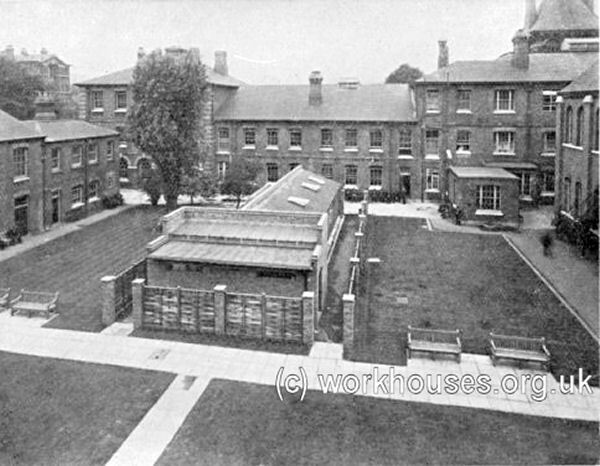 In the 1920s, the workhouse became known as the Woolwich Institution, and the infirmary as the Plumstead and District Hospital. 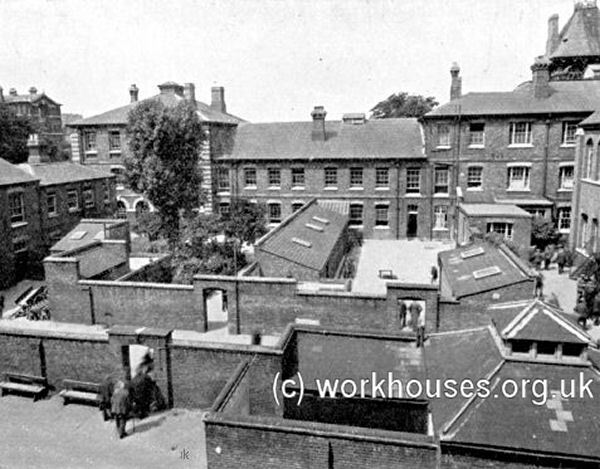 In 1930, following the formal end of the workhouse system, control of the site passed to the London County Council. The hospital section was then renamed St Nicholas Hospital and, at that time, had 320 beds. The workhouse department was redesignated as a Public Assistance Institution. As part of the changes, many of the walls that formerly separated different classes of workhouse inmates were removed as shown on below of the same of the workhouse. 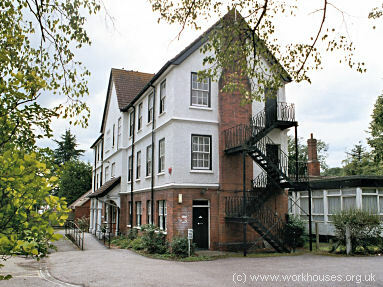 The former workhouse section became a Public Assistance Institution. In the Second World War, the site suffered serious bomb damage. In 1948, St Nicholas Hospital joined the NHS, while the old workhouse building provided temporary accommodation for homeless families. After a series of temporary closures, the whole institution finally closed in 1986. The buildings were demolished in 1992 and the site redeveloped with modern housing. In 1899, the Woolwich union erected the Goldie Leigh children's cottage homes site at Bostall Heath, to the south-east of Woolwich. 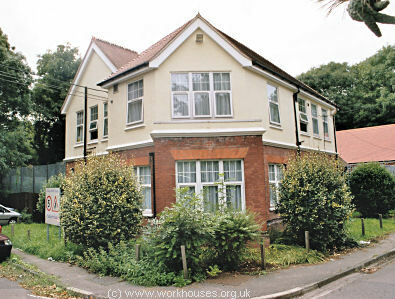 A receiving home at 43-47 Parkdale Road, Plumstead, which dealt with children prior to their being transferred to the homes. The name Goldie Leigh is believed to derive from the estate of Basil Heron Goldie (1792-1849), son of Lieutenant-General Thomas Goldie of Dumfries (c.1750-1804) and Amelia Leigh (1756-1845) of North Court, Shorwell, Isle of Wight. 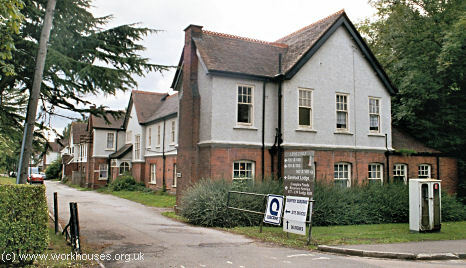 Their home, Goldie Leigh Lodge, was situated in what later became the hospital grounds. The Goldie Leigh site location and layout are shown on the 1914 map below. 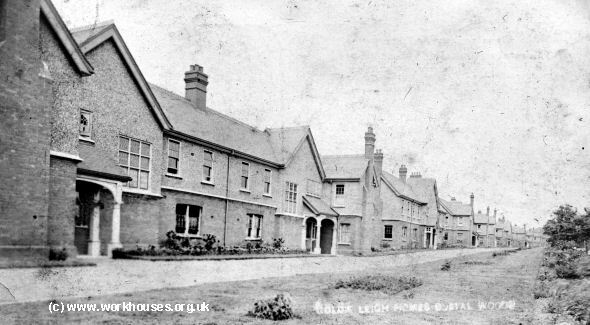 The homes comprised a row of houses along Lodge Lane, together with an infirmary, laundry and other buildings. Goldie Leigh Homes from the south, c.1905. Each "cottage" housed a group of around sixteen children under the care of a house mother. Goldie Leigh Homes house-mother and children, c.1905. In 1914, the Goldie Leigh site was rented out to the Metropolitan Asylums Board for use as a hospital for the treatment of ringworm. 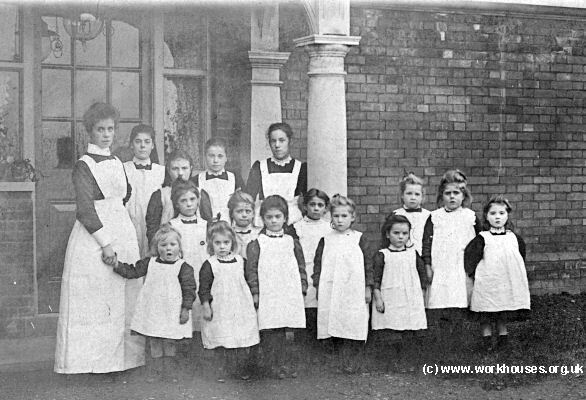 Ringworm was an infectious disease of the scalp, common amongst pauper children, for which the treatment centre had previously been the Downs School at Sutton. Goldie Leigh then gradually expanded its remit to cover a score of different conditions of the skin and scalp. Goldie Leigh Homes former cottages from the north-east, 2004. In 1930, the site was taken over by the London County Council. By 1938 it had 248 beds, a school with five classrooms, a craft room and a large hall for long-stay patients. The hospital ran its own Girl Guides, Brownies, Boy Scouts and Wolf Cub packs. In 1961, with a decline in demand for the hospital treatment of skin conditions, part of the hospital — the Bostall Unit — was adapted for the care of children who were classed mentally subnormal. It continued to provide hostel accommodation for children with disabilities until 1988. Goldie Leigh Homes Bostall House, 2004. The Goldie Leigh Hospital now provides a range of out-patient services including physiotherapy, occupational therapy, and psychiatric assistance. London Metropolitan Archives, 40 Northampton Road, London EC1R OHB. Holdings include: Admissions and discharges (1896-1944); Creed registers (1871-1943); Guardians' minute books (1868-1930); etc.